Portable Game Console Project - Graphic System Implemented! The graphic system of the portable game console project is implemented! In addition, the clock control and power saving stuffs are also implemented. This blog post focus on Graphic System. I'll save other stuffs for my next blog post. 84*48 monochrome. Each byte is 8 pixel grouped vertically. First, The background bounding rectangle is drawn. 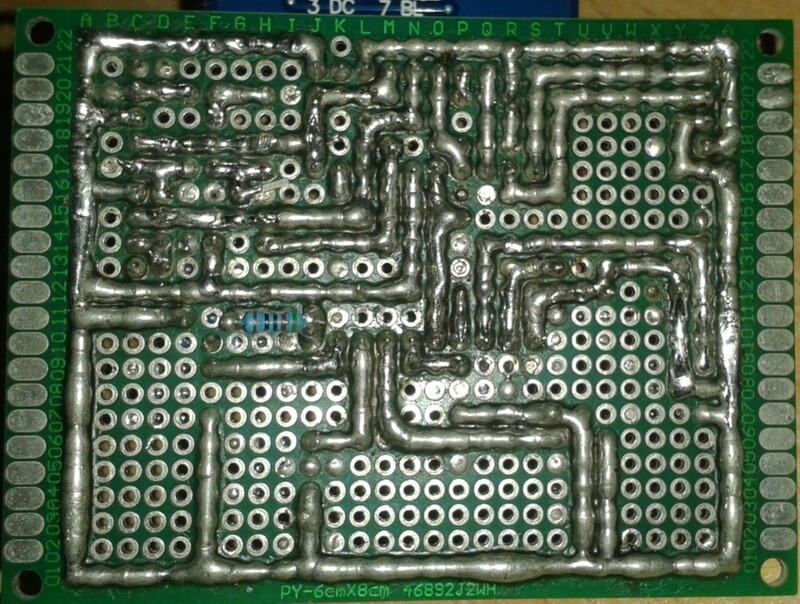 This allows the transfer operation to be done while the microcontroller is in sleep mode, saving power consumption. I've modified the sample program that I made for testing storage system, input system and synth system. Now that it's also capable for testing the new graphic system! 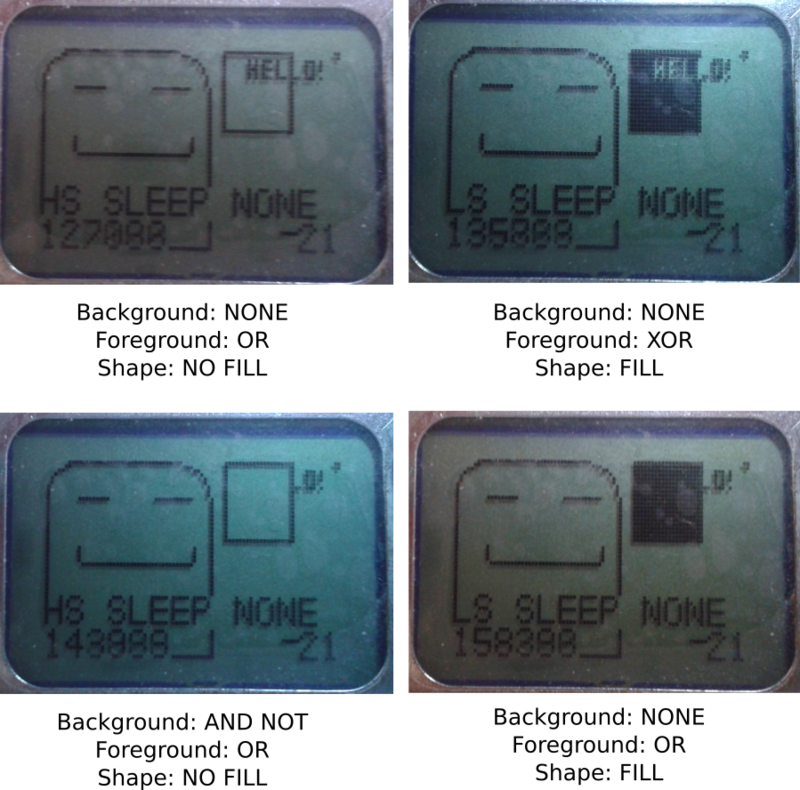 The updated sample program draws a lot of stuffs on the LCD, including a background image loaded from a resource in the ROM, a square, and system information like system tick, clock frequency and sleep mode. Fortunately, it's still possible to draw those shapes by implementing the drawing function in the game itself. I've already implemented the following features. However, these features deserve another blog post. I'll blog about them later. Find out how to put code on the RAM. And I guess I'm going to take a short break from this project. I'm going to work on a piece of music! Portable Game Console Project - Storage System Implemented! Hey guys! The storage system of my portable game console is implemented! Yes, the save content is saved right inside the ROM. Each resource is aligned to 512 bytes. It isn't possible to seek to an offset of any resources. You have to read/write everything in the resource at once. Why is the game save content located right inside the ROM? My original idea was to have two files. One is the ROM file. Another is the save file. The save file is dynamically created by the game by using the API Calls. "Cannot create file. Only existing file can be written." Using another FAT library takes a lot of work. Pre-creating a save file on the SD card would bring quite a bit of nuisance to the player because the player would have to manually paste the save file to the SD card in addition of the ROM file. So it's apparently to me that storing the save file content right inside the ROM would be the solution to go. Since the restriction of the file-writing function is "Cannot create file. Only existing file can be written", everything should be working after saving the content right inside the ROM, right? It turned out that I was mistaken. When I tried writing something on the SD card, the offset of the content being written was wrong! And some of the content were corrupted by zeros. Why? After reading the documentation again, I've found out why. The library has a function for reading from file, and another function for writing to file. The function for reading works with any file offset. However, the function for writing only works properly if the seek offset of the file is aligned to 512 bytes. Otherwise, the offset would be rounded down to the closest 512-bytes. In addition of that, the number of bytes written are padded with zeros to 512 bytes. The solution? Simple! Just align the offset of each resources to 512 bytes and pad them. Here's the file format of the ROM of the game console. 4           32      Name of the game. NULL-terminated. 36          32      Author of the game. NULL-terminated. 68          256     Game Description. NULL-terminated. 1024+8*N    4       Resource offset in file. N is from 0~255. 1024+8*N+4  4       Resource length. N is from 0~255. Can be zero. 3072        varies  The content of the resources. Each resources are aligned to 512 bytes. It's rather obvious what does the CSV do except the last line. For the resource #254, it allocates a resource that contains 1024 bytes of zero. It's useful for allocating space for save file of the game. It's simple. There're only three functions. Click here and see how does the code of the program looks like. Please notice that this isn't a complete project and it's not buildable without extif.h, which I'm not releasing until the completion of the software. As you can see above, the first byte 0x55 is the magic number. It's used for informing the program that the save data is valid. The second one is the sound ID. The value of 0x01 refers to the second sound. The third one is duty cycle. A value of 0x01 refers to 50% duty cycle. Power-saving, clock rate adjustment, etc. Introducing Portable Game Console Project! It is a minimalist, low-cost portable game console. It isn't an emulator of existing game console. It's a brand new game console system. It doesn't have a name yet. Until it's getting named, I'll just call it portable game console. It's mostly a "because I can" project. I aim to learn stuffs from this project, including drawing PCB board, electronic design, a little bit mechanic design by drawing the case of the console, embedded programming, etc. Minimalist - single color LCD, 1-bit audio. Input: 6 push buttons. Left, right, up, down, A and B.
I've never used most of these tools and software before this project. 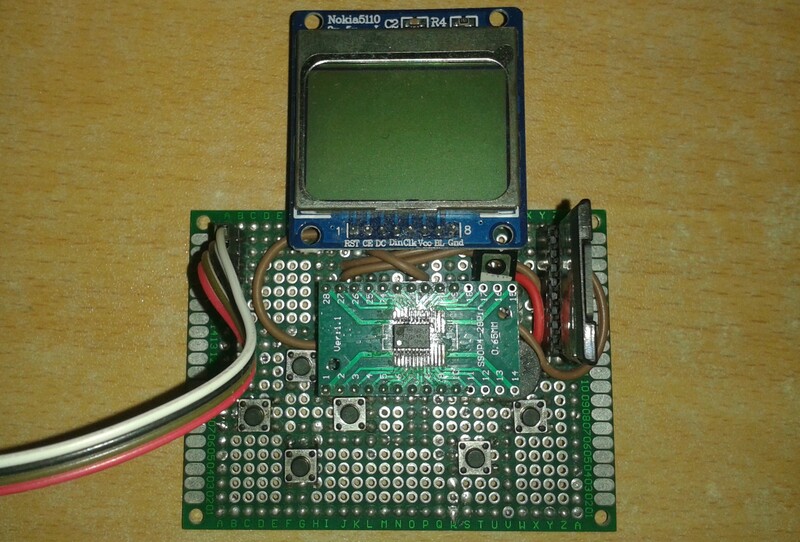 STM32F030F4P6 is the microcontroller of this portable game console. It's a low-end ARM Cortex-M0 microcontroller. It has 4kB of RAM and 16kB of Flash. In our design, the flash memory is split into two parts. The first part is the bootloader. The second part is the application (game). The bootloader contains the implementation of the API for accessing the LCD, sound system, buttons and SD card. The game is a playable that calls those API functions to access the hardware function of the game console. The RAM is also split into two parts. A small part is exclusively used by the API. The other part is available for the application. In addition to that, the bootloader will show a menu for the user to pick a game stored in the SD card. When the game is chosen, self-flashing will be performed to the application part of the flash memory. Then the BX instruction will be called to set the program counter to the starting point of the application, which will caused the game to be launched. There's, unfortunately, no protection of access. Although there's no API for that, it's technically possible for the application to, says, implement their own function to erase the SD card. The bootloader will probably take 8kB of flash and very small amount of RAM (like 100 bytes). The API call can be made by using a software interrupt. There's a fixed-address, 8-bytes storage inside the RAM. The API can be accessed by the application by first manipulating the content of the RAM of that address, then trigger a software interrupt. The interrupt EXTI line 15 is used for software interrupt. This design is inspired by int 80h of unix kernel. keysSetDebouncePeriod() is used for setting the software debounce period. The longer it is, the slower the reaction time, and less noisy the response is. For keysGetPressedState() and keysGetJustChangedState(), each bit represent the state of a button. For keysGetPressedState(), pressed button would have its bit set to 1. The non-pressed one would be 0. For keysGetJustChangedState(), pressed button that had changed would have its bit set to 1. Otherwise 0. For example, if the keysGetJustChangedState() of a button is 1, and the keysGetPressedState() is 0, that implies that the button was just released. After calling this function, the justChanged state of all buttons would reset to zero. The sound system consists of two identical 1-bit synthesizer. One of them is for sound effect (foreground), another of them is for background music. Only one of them can output sound at one time. Depending on the configuration, it's possible to pause the background music while the sound effect is being played, or have the sound effect played during its effective duration, replacing the part of background music. Fast sweep mode: reduces the duration of each sweep step to 1/4 of both frequency and duty cycle. In addition, a musical playback format is defined for this game console, which enables the application to play music by calling an API function. Piano uses a 12-suboctave scale, which means that each octave is divided by 12 notes. During frequency sweeping, the 32-suboctave is further subdivided into 16 frequencies, forming 512-suboctaves. Each step of sweep would increase/decrease the frequency by a 512-suboctave until the final frequency is reached. The frequency of the sound to be played is 2^(5+n/32) Hz, where n can be any value from 0 to 255. Generation of tone requires vibration of audio signal. For a 1-bit synth, the duty cycle determines the duration of the signal to be LOW or HIGH. Let's take a 1000Hz sound wave as an example. It takes 1ms to complete a period. If the duty cycle is 50%, 0.5ms would be spent on LOW, and another 0.5ms would be spent on HIGH. If the duty cycle is 75%, the signal would be LOW for 0.25ms, and HIGH for 0.75ms. Although this synth is 1-bit synth, it's possible to control the volume of the synth by using duty cycle. That's because the duty cycle affects the RMS value of the waveform. The closer the duty cycle to 50%, the louder the sound is. The duty cycle can be adjusted (1-1/(n^2)) * 100%, where n can be any value from 0 to 15. Unlike frequency, the duty cycle sweep does not have any subdivide mechanism. The format is simple. It's a mix of command and data. Data starts with a non-zero byte. Command starts with a byte of zero. It has 6 modes. They are STOP, DF, DCF, FULL, FULL->DF, FULL->DCF. STOP: end of music. No more command to be accepted. 0, 0 //Switch to STOP mode. It's like a NULL character for string. Your browser does not support MP3. International Asynchronous Rock Paper Scissors Tournament 2018 - Site's up! This is supposed to be an annual event. However, it didn't happen last year because the hoster failed to set up the site. Therefore, we're going to host this event on our own this year. We'll be issuing certificate of participation of all of our participants! If you're looking for a degree or a job, certificates are proven to be helpful on building your portfolio. That's why we're issuing them! Put that in your resume and we promise that'd secure your job offer or degree offer! The front-end is almost the same as the old one. Semantic-UI were used. But we've changed the back-end from Django to Flask. Flask takes much less RAM compared with Django. And it takes much less efforts to develop stuffs using Flask, especially for trivial projects like this one. I guess Django is better suit for larger scale websites. Arduino 1602 Snake Game - Snake Game on Alphanumeric LCD! I'm thinking about making an AVR (non-Arduino) portable game console. I'm evaluating the type of display to be used (including multiple 8x8 LED matrix, graphical LCD, TFT/OLED screen, alphanumeric LCD and combination of them). Then I came up with a weird idea. What if I use a alphanumeric LCD as a graphical LCD? That'd cut me quite a bit of the cost compared with using graphical LCD of the same physical dimension. Check out the source code in this github repository! Just like other snake games. The game gets approximately 1.1x faster whenever an apple is eaten. There's no wraping. You die if you hit the wall. The hardware is roughly based on this official Arduino LCD Hello World tutorial, with an addition of two push buttons. The left push button is connected to D8, while the right push button is connected to D9. Both push buttons are pulled-down. For other connections, please refer to the schematics in the tutorial. HD44780-compatible LCD driver supports up to 8 custom characters. By carefully defining those 8 characters, it's possible to subdivide each character into multiple "pixels". That can effectively turn the alphanumeric display into a graphical LCD display. There're two "pixels" in each character. Each pixel can have three possible values. Therefore, the total combination is 3^2 = 9. Since one of these combination is visually empty, a space character were used to represent that. At the end only 8 custom characters are needed. So the 8 available characters in CGRAM of HD44780 are just enough for our purpose. To reduce RAM usage, each pixel is represented by 2 bits. So a byte can store 4 pixels. Everything is cramped into a uint8_t graphicRam[GRAPHIC_WIDTH*2/8][GRAPHIC_HEIGHT]. At width of 16 and height of 4, only 16 bytes of RAM are taken for the graphic! Had I used a uint8_t for each pixel, 64 bytes of RAM would be required. After the completion of this project, I've found other designs like spliting each character into three rows, or try making use of all pixels by generating the CGRAM on-the-fly. I'll consider using these techniques for my future projects. To make the position looks random, we need to somehow seed the random number generator. For computer programs, we usually seed it with the current time of the machine. However, this couldn't be done on Arduino because it doesn't have a real time clock. My solution is to make a menu screen of the game. When the user start the game, the time of the moment that the user pressed the button is used to seed the random number generator. The micros() method of Arduino Time library were used. This has the equivalent effect of using system time. I was having fun playing with this game. I thought that it was reasonably bug-free because I had played it for a while. I've also asked one of my family members to try it out. I swear. We haven't spotted any bug. Until I tried to record a video of the game play, something funny happened. I realized that I haven't implemented self-collision detection of the snake. I was like "Wow. How come no one had notice that earlier?". Hah. What a terrible failure! Upon the discovery of the bug, it was fixed in no time. Seems that using alphanumeric LCD as graphical LCD is promising. I'll consider going for this solution for the portable game console project. Of course, I won't be using Arduino for that. Arduino is good for prototyping. But it isn't as efficient as lower-level C/C++ programming. Alright. That's enough fun for today. Gotta sleep.